Location: Westin Chicago North Shore, 601 North Milwaukee Avenue Wheeling, IL 60090, USA. Saturday is a day of two halves - the first half consists of the regular seminars and the show hall, the second half is the banquet and presentation of awards. Going back a few years, seminars on Saturday were an exception and only held if there was no way to fit them in during the previous three days. 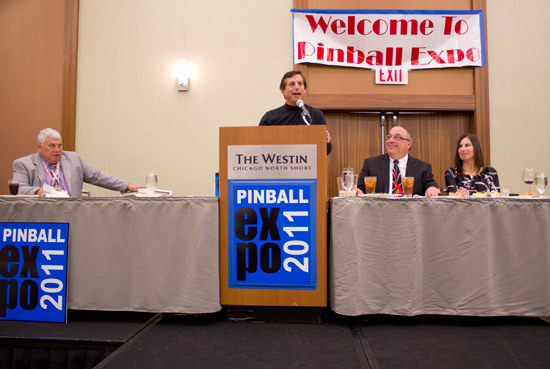 Now though, Saturday seminars are a regular part of the Pinball Expo schedule. This slot was intended to be taken by Seamus McLaughlin talking about his days as a pinball artist. 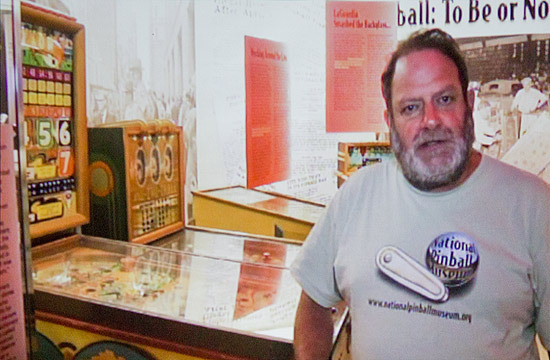 Unfortunately Seamus was unable to attend, so instead there was a video presentation by David Silverman showing the National Pinball Museum in Washington. The Museum was in the process of moving to its new home at The Chocolate Factory in Baltimore, so this was a final look at the Georgetown Park home and the various exhibits on display there. Because David's video was largely visual in nature, we do not have an audio recording of it here. 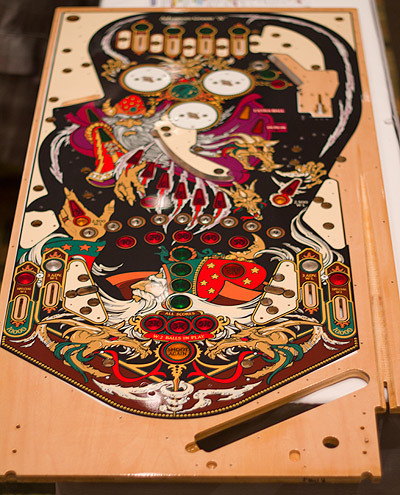 John is a regular at Pinball Expo and he used this visit to update the audience on his direct ink projects to recreate the artwork on both playfields and backglasses. This procedure uses a large format ink jet printer which can print directly onto the wood or onto glass. John can then clearcoat the newly printed playfield, although there had been issues with the clearcoat reacting with the ink. He said the newer printers can lay down a white layer on the playfield first, which replicates the process he formerly did by hand. After printing, some printers can even lay down a clearcoat layer as well. John explained the techniques he had found effective and those he had tried which did not turn out so well. He detailed the products he had tested and how effective they had proved to be, as well as several different methods for scanning or photographing playfields and backglasses. You can also use the player below to play it within this page. 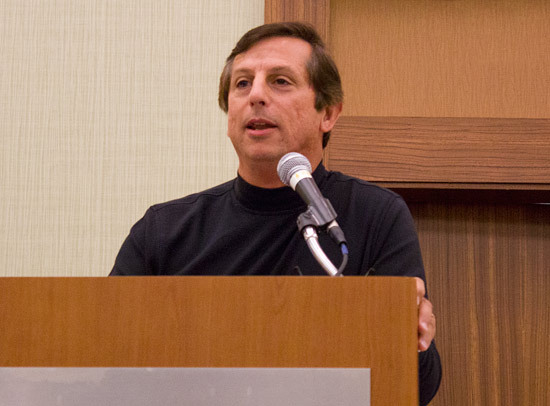 While Wayne is a regular speaker in these 'Reminiscing with...' seminars, he is usually joined by Steve Kordek, Alvin Gottlieb or Michael Gottlieb. 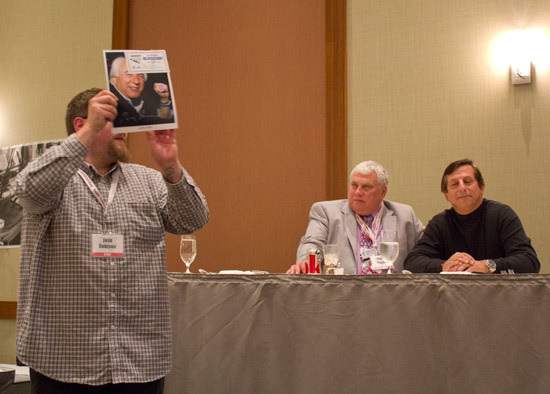 This year, however, Steve was unable to attend, as were Alvin and Michael, so Roger Sharpe joined Wayne in the armchairs to look back at their many combined and individual years in the pinball industry. 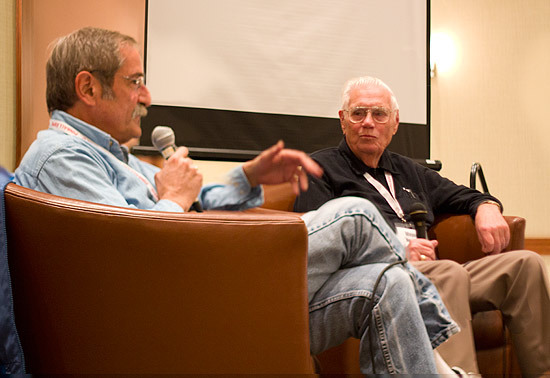 Wayne began with a story about the formation of the coin-op manufacturers trade association, CMI , which had David Gottlieb as its president. The association sponsored the Damon Runyon Cancer Research Foundation as its chosen beneficiary - name after the famous author - and Wayne told how he named one of his games in honour of Damon, and offered a signed original flyer for the flipperless 1953 game if anyone could name it. The game was Guys and Dolls, named after the musical which is based on two of Runyon's stories; The Idyll of Miss Sarah Brown and Blood Pressure. Wayne then talked about the way distributors were initially forced to buy a certain number of games, whether they could sell them or not, but in later years this changed so distributors stated how many they wanted at the start of production and that number was fixed until production was coming to an end, when they could either buy more, or trade any overstock they had with other distributors. Roger then spoke about how stories he had heard about Bally distributors not buying games at the start of production but waiting and checking prices at the factory daily to try to snag the best deal. 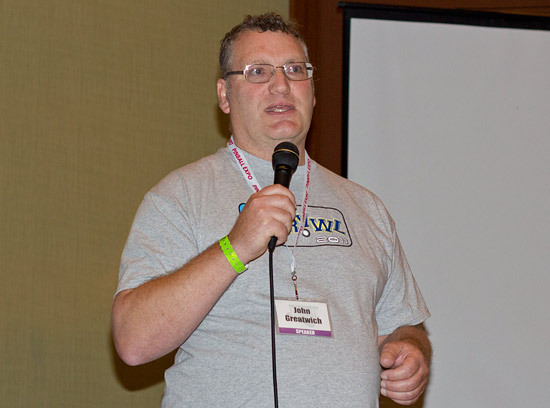 He also compared the friendly rivalry and co-operation between manufacturers in evidence during pinballs golden years to the cutthroat competition between pinball companies in evidence in more recent times. Roger then answered a question from the audience about Bill Gursh who started at Billboard magazine before launching Cashbox magazine from offices in Chicago. When he retired to Florida he printed a publication called Marketplace using his extensive archives of photographs. Roger called him a "remarkable guy" who provided the opinionated voice the industry needed in the post-war years, whether he was right or wrong. 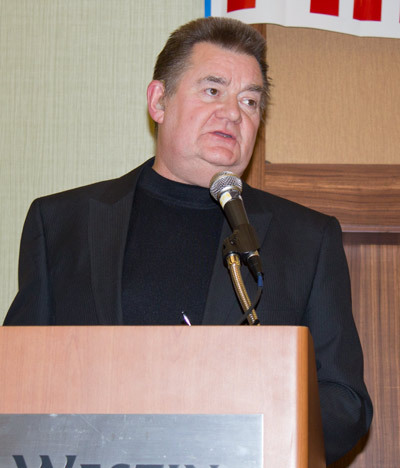 Roger also spoke about the start of licensing in pinball by Tom Nieman at Bally and how the concept of licensing both within pinball and in the wider world has expanded enormously since then. 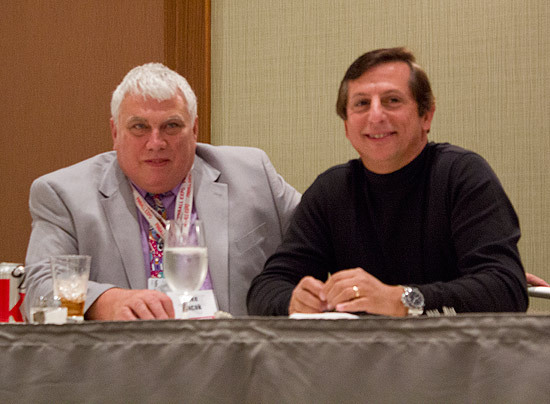 Wayne and Roger brought the two-and-a-half days of Pinball Expo seminars to a close. 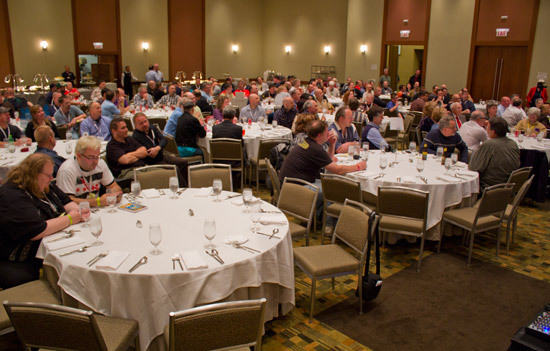 But that doesn't mean we don't have more audio to bring you, because after the seminars had ended, and the autograph session which followed had been and gone, the main event on Saturday's schedule was the evening banquet. 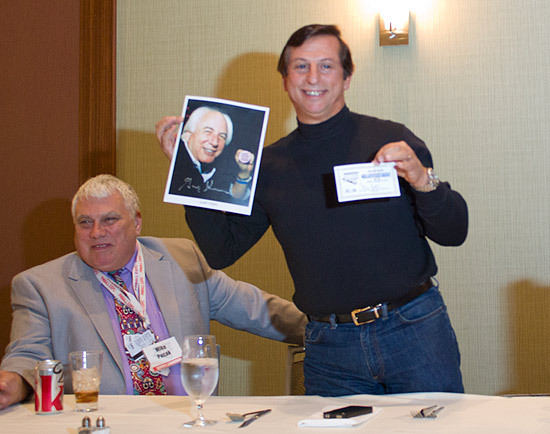 The guest speaker this year was Jack Guarnieri of Jersey Jack Pinball who would give his address to the audience once dinner had been served. 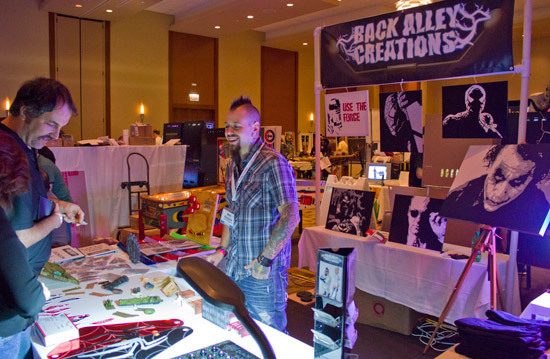 As usual, events began with the Make-A-Wish charity auction where assorted items of pinball and amusement paraphernalia came under the hammer with the proceeds going to the charity. The charity auction raised nearly $4,800 for the Make-A-Wish Foundation. Once dinner had been served it was time for Jack to give his address to the assembled guests. 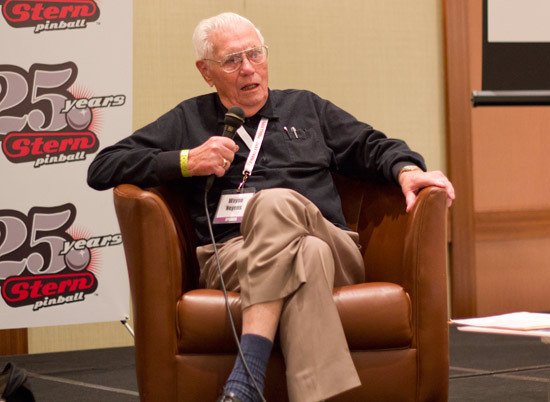 After thanking his hosts and the staff of Pinball Expo, Jack spoke about his upbringing in Brooklyn and how that never afforded him the opportunity to play pinball. After leaving school, he took some time off before going to college, answering a job advertisement in the paper for a pinball mechanic. He got a job with the company which operated game rooms including electro-mechanical pinball machines in the metropolitan New York area. Jack decided then that whatever he ended up doing, he was determined to be the best person doing that job. After several years in that position, Jack became an operator himself, with several hundred pinball and video machines in locations across New York. He said they earned so much in those years that they never counted the takings, they just weighed them. He said that operator sales were the reason pinball existed and grew like it did in those years. But, he said, without the sales to home buyers and collectors in the past few years, there would be no pinball companies around today. 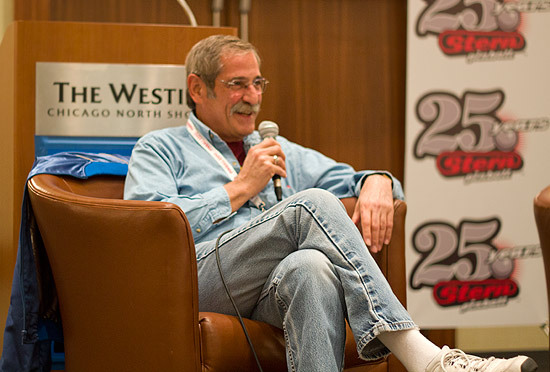 Jack listed the games in his home and the features in each one he enjoys, but having been a operator and distributor with so many games passing through his hands, he said coming to shows like Pinball Expo and playing the machines is like visiting old friends. After talking about great predictions through history which have proved to be wrong, Jack touched on the co-founder of Apple, Steve Jobs (who had passed away two weeks earlier) and who also had his share of rejections. Jack picked on the attributes which he admired about Steve, which he strived daily to match. 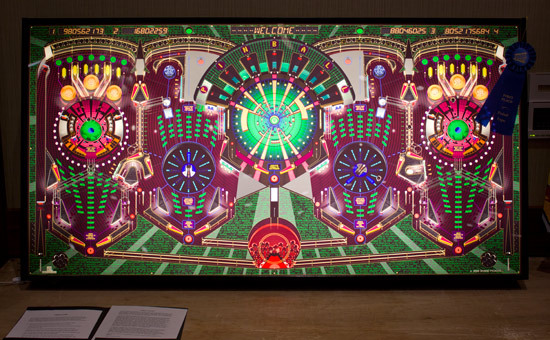 In conclusion, Jack likened the battle against the machine during a pinball game to life's challenges and obstacles, urging the audience to be like that pinball player; perpetually trying to beat the game, but always walking away with the highest score possible. Following Jack, a number of awards were given. 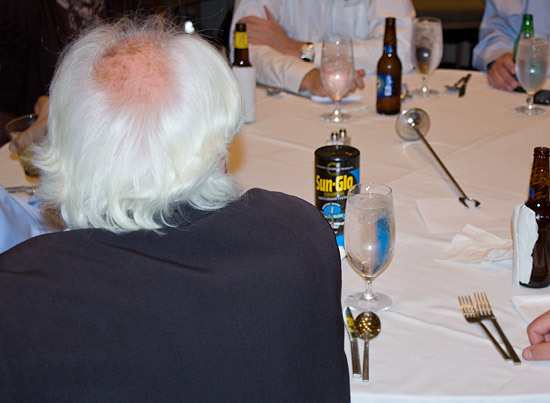 The first was to Jack himself for being the banquet guest speaker. 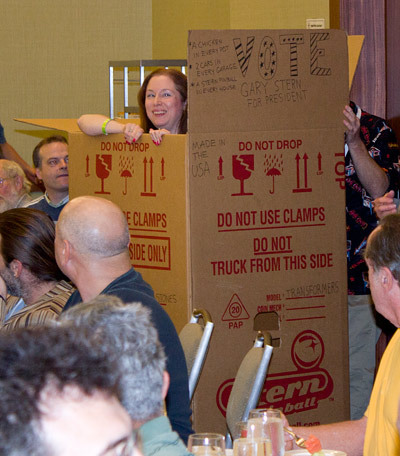 There was a 'dress like a pinball machine' contest at the banquet which brought two entries. 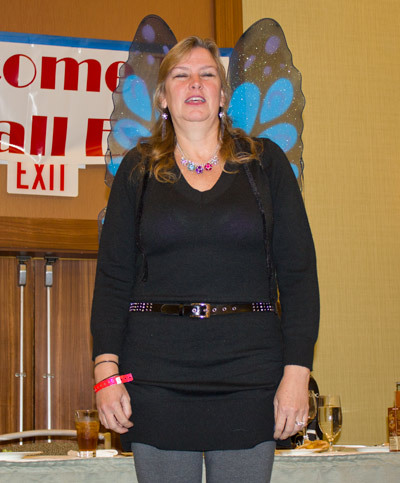 The first was from Phoebe Smith who came to the dinner as Farfalla. She was competing against Cheryl Sweppy who was portraying a new-in-box Stern game. Unable to choose between the two, the contest was declared a draw. 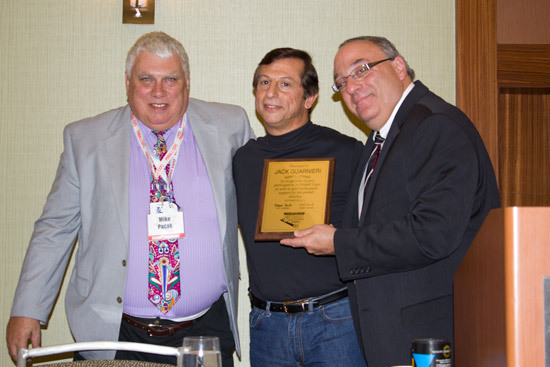 Next, Rob Berk was the recipient of an award, this time from Cid Rudis from Brazil who described coming to Pinball Expo as like arriving in Heaven. 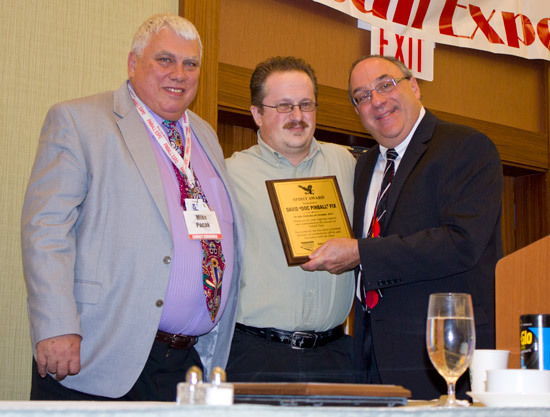 Mike then announced the awards for the best exhibitor displays. 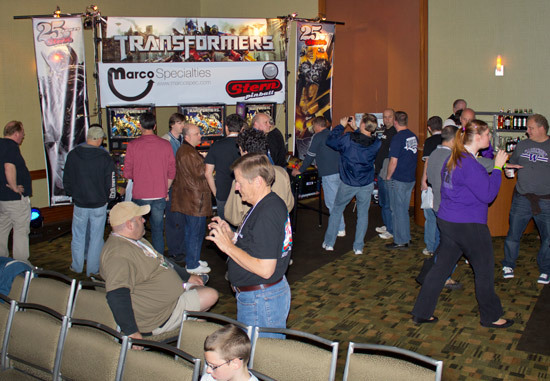 The runner up was Back Alley Creations and the overall winner was Marco Specialties who, in addition to their stand in the main hall, also supplied the set-up for the Transformers launch party. Next, the winner in the art contest was announced. First place went to this illuminated panel by Shane Pickerill. 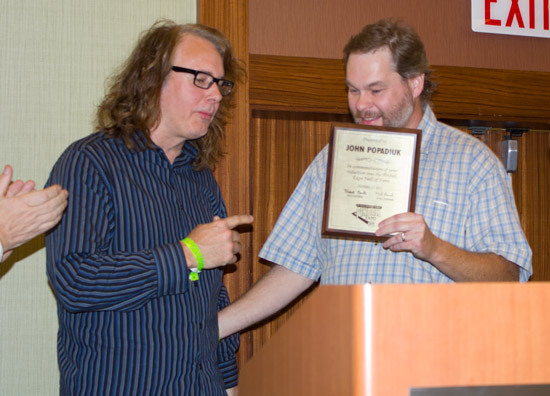 A new Sprit Award was the presented to David Fix who created all the posters for the seminar room and provided technical support throughout the weekend. 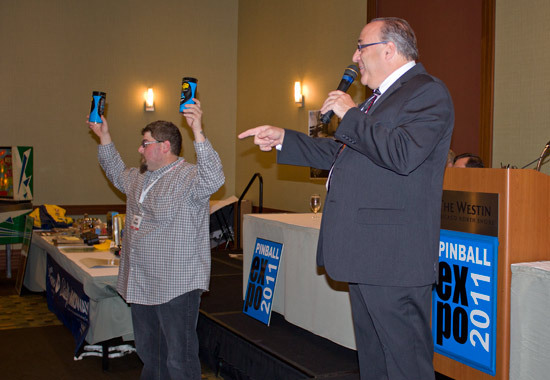 The two newest inductees into the Pinball Expo Hall of Fame were the next announcements at the banquet. The first could not be present this evening but was inducted in his absence by his brother Steve. 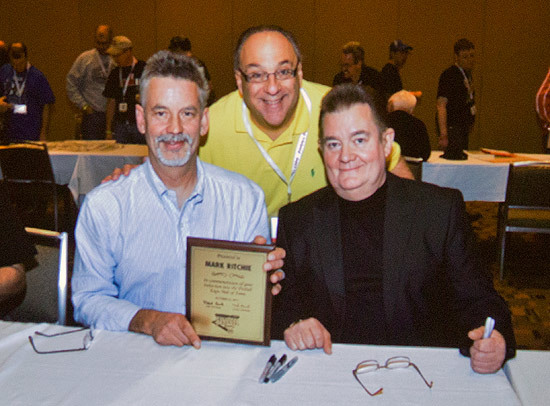 Pinball designer Mark Ritchie became the first of the new members of the Hall of Fame. His award was presented to him earlier that day. The second inductee was introduced by Michael Hanley. 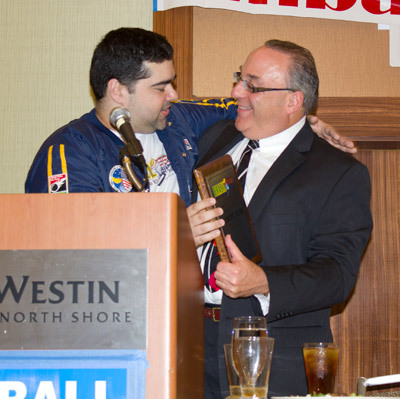 He spoke about how he came to meet and befriend the latest recipient, revealing that the award went to pinball designer John Popadiuk. John gave a brief talk in which he described how he became interested in pinball, started creating game designs, got his break in the industry and those who mentored him at Bally and Williams. 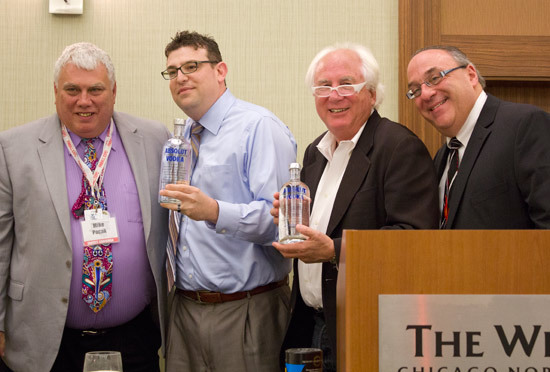 The final presentations of the evening were gifts of thanks to Gary Stern and Jody Dankberg of Stern Pinball for their help with the show and the Stern Pinball factory tour. They both received bottles of Absolut vodka. 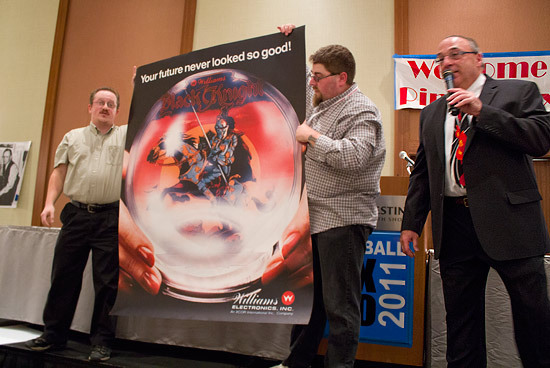 That concludes our look at the seminars and the banquet from Pinball Expo 2011. We'll be back with the final part looking at the Flip Out Tournament and the main hall exhibitors.